This page presents information for instructors to help them get started using their Moodle course web site . Help for students is here . Pro Tip: Every Moodle page has a “Moodle Docs for this page” link at the very bottom which takes you to the official Moodle documentation for that page. Click it for instant help! New! Check out a playlist of introductory videos  about Moodle! Click the “Turn editing on” button in the upper menu bar to activate the editing mode and add activities and resources. Main Idea #1: Unlike Blackboard, Moodle is really just a single page. It is possible to create new pages off the main page, but nearly everything is accessed from the main page. Main Idea #2: Moodle organizes your course page into individual sections, arranged into weeks or topics. You may add new sections at any time or remove unneeded ones. You add content to a specific section by clicking “Add an activity or resource…” in the section and then choosing the activity or resource you want to add. At the very top of the course is the course summary section. This section is always visible and is where you might place resources and activities that aren’t connected to a particular section or week. The “News forum” is the announcements tool, and it allows students to leave replies to the messages. Click the gear icon at the top of the summary ( ) to edit the summary section. The gear icon appears throughout Moodle site and is always used to edit text areas. 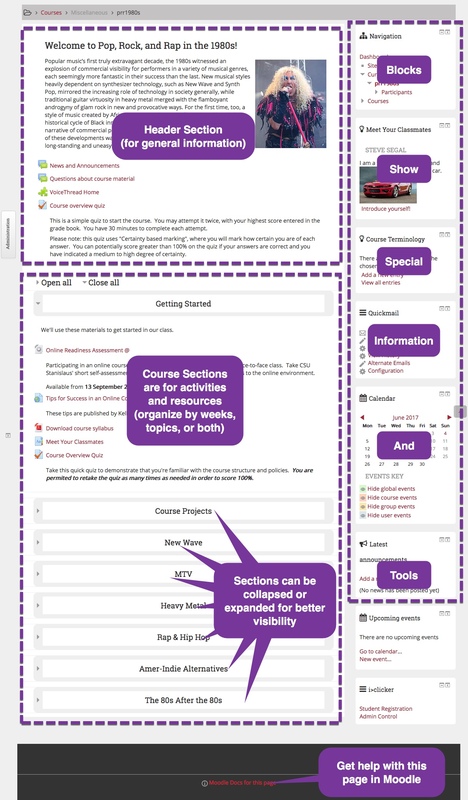 Along the right side of the page are “blocks”, which are specialized bits of Moodle content, such as the course calendar and the Quickmail email tool. With editing turned on, you can add or remove blocks. Click the “Add a block” dropdown menu to see the full list of blocks you can add. Go to Course administration > Configuration to change the format or layout of the course sections, as well as the course start date. In a "weekly" format, the start date will determine the dates that are shown automatically for each section. If desired, change the layout of the content in the Course format portion of the settings page. Scroll down and click “Save and return to course” to see the changes. All the settings on the settings page are non-destructive, so you can experiment without worrying about losing any data. For example, you can try the “Grid” layout for the course format. It transforms the scrolling list of sections into a grid of clickable cells, each with a cover image for added visual impact. Pro Tip: Dock the Administration Block. "Docking" a block means to pin it to the upper left side of the screen, where it's far easier to access than in its default position, which requires some scrolling to find. How to Dock: Click the "<" icon in the upper right corner of the Administration block. That's it! icon for editing the summary description of the section. icon to reorder the section on the page via drag-and-drop. Each item in a section has its own "Edit" dropdown menu for changing the item's settings and other actions. You can edit the section summary in addition to adding activities and resources to the section. Click the large “gear” icon on the left edge of the section to begin typing your summary. On the editing screen, you can also change the default name of the section. Option 1: Drag the file from your computer directly into the section to add it instantly. That's it! Once added, click the “pencil” icon ( ) to edit its display name if desired. Option 2: Click “Add an activity or resource” for the section and then choose “File” from the list of choices and click “Add”. Or, click inside the “Select files” box and then locate the file to upload, such as from your computer, Google Docs, or Dropbox. Click the “Add an activity or resource” link in the section where the item should appear. Choose the type of activity you want to add. Click the name of an activity to read a short description of what it does and how it might be used. Click “Add” to begin configuring the activity. TIP: On the configuration page for the activity, each setting has a “?” icon next to it. Click that to get an explanation of that setting. Scroll down and click “Save and return to course” when you’re done. Activities can be dragged into different orders within a section, or dragged into different sections. Just grab the “four-headed-arrow” icon ( ) next to the activity and drag it into a different place on the page. Voila! TIP: When activities are configured to be graded, they will be automatically added as an item in the gradebook. When it's time to grade the activity, simply click on the item on the Moodle course page to open the activity and begin grading. To build a quiz, you first establish a quiz shell and then you fill the shell with questions. Similarly, your quiz is “worth” the total number of points of the questions contained within it. The point value of the quiz is the sum of all the questions' values (each question can be worth 1-250 points). Or, you can specify a custom point value for the quiz that is not the same as the sum of the questions. In that case, Moodle will do the math for you to display the correct final score for each student. Configure the overall settings of the quiz activity and click “Save and display”. Click “Edit quiz” to begin adding questions. Click the “Add” link on the right of the question area to add your first question. There are several options to choose from, including "Create a question" and "Random question". Continue adding questions to the quiz. Adjust the total points for the quiz, if necessary. When you create questions, they are automatically stored in the Moodle question bank for the course. You can access the question bank at any time by going to Course administration > Question bank. Questions can be added to the bank without having to create a quiz first. When you build a quiz entirely from random questions (this is useful as an anti-cheating strategy), the questions will be drawn from the question bank. Take a test drive of your quiz by clicking the “Preview” link under Administration > Quiz administration. Access the grade book from Course administration > Grades. You first arrive at the “spreadsheet” of all the students and their grades. The page scrolls off to the right… To set up your gradebook structure along the lines of your syllabus, click the “Setup” tab above the spreadsheet. First, set up the Aggregation/Calculation method for the whole gradebook. This setting determines how Moodle will calculate the running total for each student. 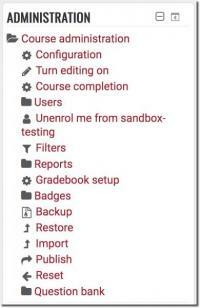 Click “Edit” in the grade book row with your course name in it (there is also a small folder icon next to the course name), then choose “Edit settings”. Choose “Weighed mean of grades” from the Calculation method drop down if you organize your grades based on percentage weights instead of straight points. If desired, create grade categories into which you will place your activities and other offline grade items (things such as “Participation”, if you have them). Choose “Simple weighted mean of grades” as the calculation method for the category so that the points will simply add up, with the total being weighted. However, choose “Weighted mean of grades” for the category if you plan to weight each item within the category in addition to adding up their points (e.g. : In your “Term Paper” category, which might be worth 40% of the total course grade, you require a rough draft and a final draft, and the rough draft is worth 20% of the assignment and the final draft worth 80%). Click “Save changes” to return to the Setup screen. Manually input the weights of each category or each stand-alone item that will be weighted alongside categories. Make everything add up to 100%. Offline grade items: Click “Add grade item” to create a new offline grade item in the gradebook (“offline” means it’s not connected to a Moodle activity). In the item's row, click Edit > Configuration. Expand the "Parent category" section of the settings and check the box for "Extra credit". Rearranging items: Move items and categories around in the gradebook by clicking the double-headed arrow ( ) next to the item you want to move. After the page refreshes, click on the "target" box ( ) where you want the item moved to. Change the view: Click the “View” tab to go back to the spreadsheet view of all the students and all the grades. Changing grades directly: You can manually input grades into the spreadsheet if desired. Just click on a cell, type the score, then press <enter> or <return> on your keyboard. Grades that come from Moodle activities can be manually changed. Remember! 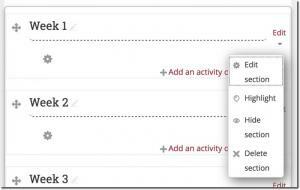 When you create activities that can be graded online in Moodle, they will be automatically placed in the gradebook. You place them in a category when you create the activity, but it is possible to move things around at any time. Open a page in Moodle where the regular text editor appears. Place your cursor at the spot in the text where you want the video to appear. Click the "movie camera" button on the tool bar to open the recorder. First time: You must allow Moodle access your webcam. Be sure to tick the box for your browser to remember this choice! Note: The recorder will actually be running in the background while you're allowing the access. You may need to click "Stop" to restart the recording process. While recording, you may stop and start again as often as needed. Click "Play" to review the recording. Important: Click "Upload" to transfer the raw recording to the offsite processing server. When the "Upload complete" message appears, click "Insert" to insert a placeholder for the video into the text editor. After recording, the Moodle text editor will only display a link to the recording while you’re editing. The actual video will be visible after you save your changes. Note: Students can also record video in text areas using the same tool! Need Moodle assistance? Contact Glenn Pillsbury .